This article is about enemies who are werewolves. For the condition lycanthropy, in particular the effects it has on you, see Lycanthropy. Werewolves are monstrous, wolf-like creatures that roam Skyrim. They are taller and broader than man and mer, and are capable of moving on two limbs or sprinting on all four. They have a weakness to silver weapons, but are incredibly strong, very fast, and are immune to diseases and paralysis effects. You can become a werewolf through a ritual during The Companions questline. In Skyrim, several named NPCs are werewolves. The Silver Hand faction is known to hunt them and werewolves are often found in their encampments locked in cells (as in Gallows Rock and Driftshade Refuge); you can recognize a Silver Hand base by the presence of werewolf heads on pikes. Many werewolves in Skyrim are seen in both human and werewolf form, such as the members of The Companions or the Frostmoon Pack on Solstheim in Dragonborn, while werewolves encountered in the wild are always seen in their beast form, with the exception of two random encounters. Hostile werewolves can only be encountered in the wild through the Dawnguard add-on. 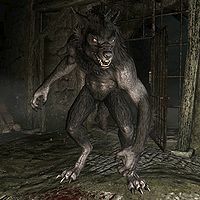 Werewolves in Skyrim are strongly tied to the Daedric Lord Hircine; in fact, the members of The Circle were turned into werewolves by the Glenmoril witches, who serve Hircine. Those with the beast blood are prone to violence, whether accidental or intentional, as they live with a constant bloodlust which drives them to kill and devour their enemies. 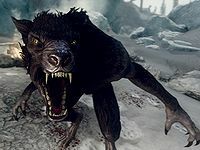 Werewolves are widely feared and hated in Skyrim as in other provinces, and will be attacked on sight if spotted in beast form. They possess deadly armor-piercing claws and incredible strength, and are capable of easily knocking most creatures they encounter to the ground. The werewolves listed below can be found in cages in Silver Hand lairs and will become hostile when released. If Dawnguard is installed, they can also be encountered in the wild along roads and in the wilderness at night, or as part of random encounters. Werewolves carry no weapons and wear no armor, but there is a 50% chance they will be wearing a pair of ragged trousers. If Dawnguard is installed, werewolves will drop a wolf pelt and human flesh, and have a small chance of dropping a random assortment of gems, rings, and a few pieces of gold when killed. The "Werewolf Claws" spell used by the werewolves listed below is unique to non-player werewolves. It is a constant-effect spell that gives werewolves a Fortify Unarmed Damage bonus, which becomes increasingly powerful for higher-level werewolves. All of the werewolves listed below are members of the Werewolf NPC class. ^1This Werewolf Brute is also the template used by the Pack Members summoned with the Totem of the Moon perk. 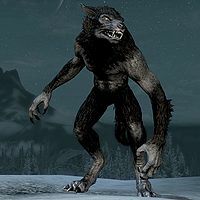 If Dawnguard is installed, werewolves carry no weapons and the leveled armor is replaced with the same outfit as their generic counterparts (a 50% chance of a pair of ragged trousers). They will also drop the same items as generic werewolves (Dawnguard only). All of the werewolves listed below are members of the "boss" version of the Werewolf NPC class. Dead werewolves cannot be raised with Dead Thrall, but can be raised multiple times with the Ritual Stone. The Dragonborn add-on adds werebears, a new type of lycanthrope. However, players cannot transform into these creatures. For more information on werewolves of the Elder Scrolls universe, see the lore article.